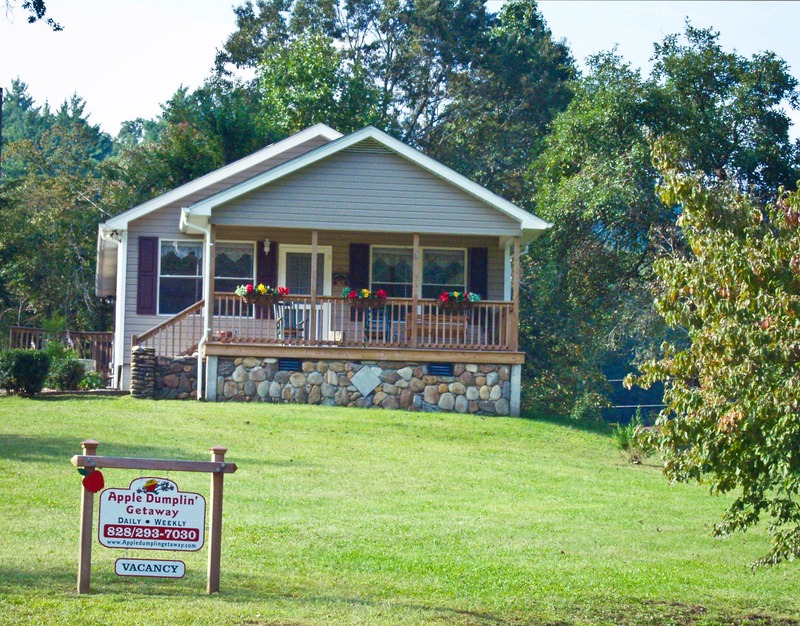 We are 6 miles from WCU, convenient to town, yet private. River below the cottage offers: Trout Fishing,kayaking,swimming and Gold & Garnet Panning. Go Hiking, take a picnic & visit beautiful waterfalls, Roast Marshmallows on the chimenea or knock the chill off cool evenings, Large picnic table with grill & horseshoes for family fun, front porch has rockers & swing to enjoy morning coffee & a good book, board games & Satellite TV w/DVD for those rainy days. Large front and back yard for kids to play ball, Frisbee or just enjoy!! We offer early check-in & late check out when available at NO additional charge. Linens included and NO cleaning fee on multiple night stays.2 night minimum preferred. Our Cottage is very clean, family friendly, affordable & open ALL YEAR. We have families who visit us multiple times thru out the year & have made coming to the Apple Dumplin' Cottage a family tradition.Our most common compliment is, "This is our Home away from Home." We have a complimentary beverage basket & chocolates awaiting your arrival. We offer specialty baskets for Anniversary's, Birthdays, Weddings, etc. at your request for an additional charge. At Christmas, the cottage is decorated and awaits your arrival. We offer a FREE visit from Santa and he will bring your child a goodie bag, or you can supply a special gift. Special Holidays and occasions we have fresh apple bread, muffins or homemade apple butter for our guests. There is popcorn for movie night & marshmallows to roast for your enjoyment . There are 3 nearby Lakes for boating, bass fishing, etc. You can call DreamCatcher Guides or AB Fly Fishing to set up a great day of fishing on the lake or river. Visit downtown Sylva for unique shops, Breweries, book stores and more. You may want to visit Cashiers for Antiques, and shopping, Dillsboro to ride the Great Smoky Mountains Railroad and visit all the great craft shops in that area, The Cherokee Indian Reservation is only 45 min away and Harrahs Casino, Seasonal Snow Skiing & Snowboarding about 50 min, & The Bilmore Estate & Winery in 1 hour.Golfing is available at several different courses in the area.Jackson county has craft and artisan festivals thru out the year and we have that information for you at the cottage.FREE concerts on the Creek in Sylva every Friday night May - Labor Day.